Guest house "Azovushka" is located in the center of the village. 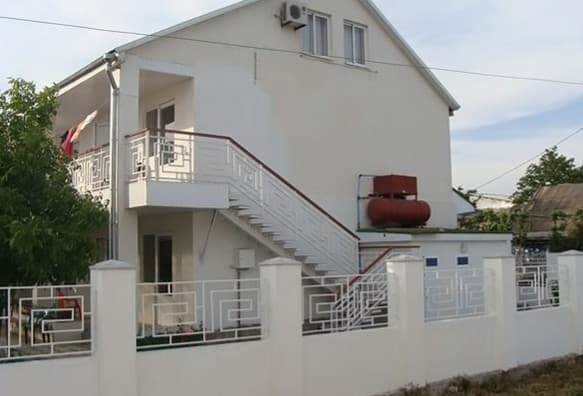 Kirillovka in 5 minutes walk from the Azov coast (400 m) The guest house provides vacationers with rooms of "Lux", "Junior", as well as 2-, 3- and 4-bed rooms of "Standard" class. Each room is equipped with necessary comfortable furniture: sleeping places with orthopedic mattresses, a wardrobe, a bedside table, a mirror, a table and chairs. The rooms of the "Junior" class have 2 rooms: a hall, a bedroom. 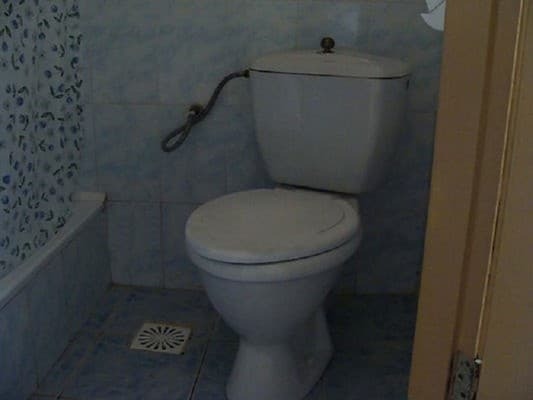 The rooms of this class are also equipped with shower, WC, satellite TV. 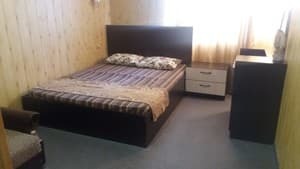 Description of the room: The room is furnished with two single beds with orthopedic mattresses, a wardrobe, a bedside table, a mirror, a table and chairs. The flooring is Euro-linoleum. Shared kitchen is located in the courtyard. Shower and toilet are in the yard. 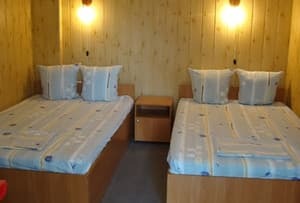 Description of the room: The room is equipped with a single and double bed with orthopedic mattresses, a wardrobe, a bedside table, a mirror, a table and chairs. The flooring is Euro-linoleum. Shared kitchen is in the yard. Shower and toilet are located in the courtyard. Description of the room: The room contains all the necessary comfortable furniture: 2 double beds, a wardrobe, a bedside table, a mirror, a table and chairs. The flooring is Euro-linoleum. Shared kitchen is located in the courtyard. Shower and toilet are in the yard. 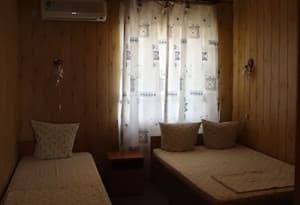 Description of the room: The room has 2 rooms: a hall and a bedroom, are equipped with all necessary cozy furniture: a double bed with orthopedic mattresses, a wardrobe, a table, chairs, bedside tables. Room size is 24 m². Shared kitchen is located in the courtyard of the guest house. Description of the room: "Junior Suite" has 2 rooms: a hall and a bedroom. 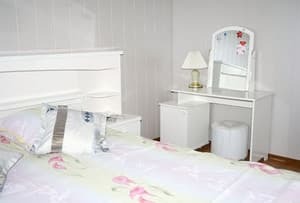 The hall is furnished with bedside tables and a large built-in wardrobe, the bedroom has a double bed and a single bed with orthopedic mattresses. The flooring is carpet. 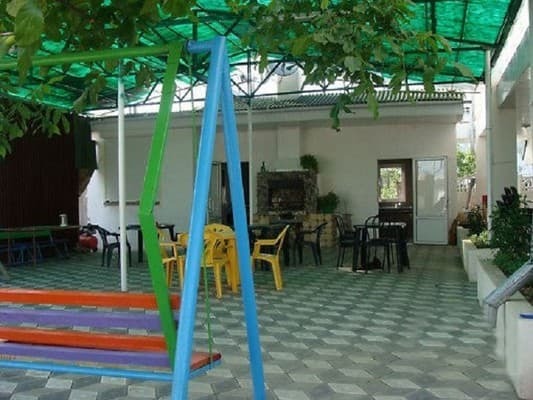 Shared kitchen is located in the courtyard of the guest house "Azovushka". Отдыхаем в Азовушке второй год подряд. Ездили с 2 детками, 7 мес и 1г 10 мес. И в этот раз остались довольны. Центральный пляж Кирриловки весь забит людьми, но если пройтись в лево или в право, то намного меньше людей, просторней, и дешевле лежаки. 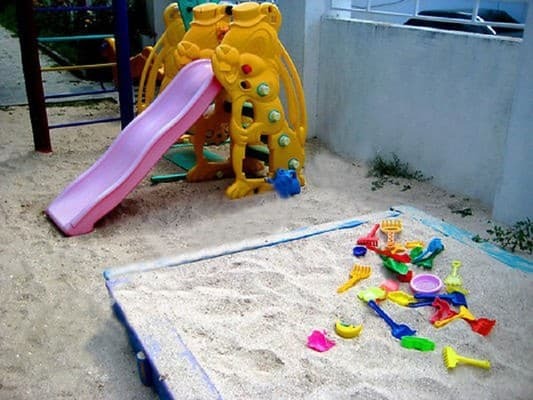 Guest house "Azovushka" provides the possibility of additional establishment of a crib for children up to 4 years for a fee. It is possible to provide an additional Mpsta in the form of an euro-clamshell. 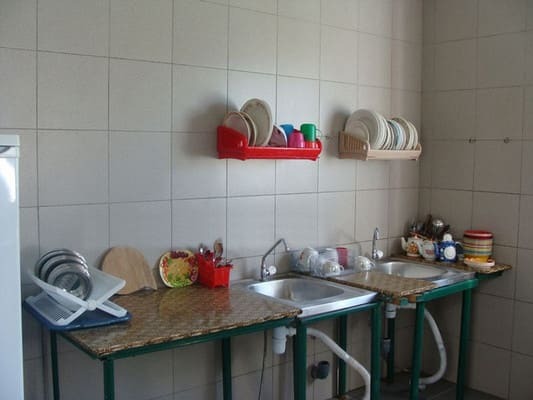 On the territory of the guest house there is a common kitchen for self-cooking, which includes 2 refrigerators, 2 gas stoves, a microwave, sinks, and all the necessary utensils. In the courtyard there is also a grill. It is possible to order food (in the range of home-cooked dishes). Nearby are cafes and catering points. Guest house "Azovushka" is located in the center of the village. Kirillovka is 100 meters from the beach. By shuttle bus or bus going from Akimovka or Melitopol to the town of Kirillovka.